Tired of Wasting Time Finding Filtered Columns? Time Consuming task in Excel! Filters are an amazing feature of Excel. They allow us to hide rows across multiple columns so we can tie out numbers and find the data we are looking for. If you work with large data sets, then you probably spend tons of time looking for filtered columns. We have to scroll horizontally across the sheet to locate that tiny little triangle icon in the top header row of the filter range. This can be a very time consuming when more than one column is filtered. We have to scroll back and forth horizontally until we find the filtered column we are looking for. "I feel like I'm playing a game of ping-pong when trying to find a filtered column. I scroll left, right, left, right,... across the worksheet until I locate the filter icon with the tiny triangle. Most of the time I just clear all the filters and start over..."
After we finally find the filtered column, we then have to click the filter drop-down menu (or press Alt+Down Arrow) to view the filter criteria. Then repeat that entire process for the next filtered column. This process of finding filtered columns can take a lot of time out of our day. And it's boring repetitive work! We can also spend a lot of time looking for columns we want to apply filters to. The data sets we work with can have 20, 30, 50 columns or more! You might know the name of the column you want to filter, but it can take a lot of ping-pong (horizontal) scrolling to locate the column. Do you just Clear All Filters & Start Over? Don't worry, you're not alone! Often times this is faster then scrolling horizontally to find the filtered columns. But this is re-work. We end up applying some of the same filters, and waste time in the process... Argh! I have been using Excel all day, every day for over 10 years. In that time I have filtered A LOT of data sets! If you read the Excel Campus blog or watch my videos, then you know I'm all about efficiency with Excel. I love using keyboard shortcuts and finding the fastest way to accomplish a task. ​When it comes to filtering, I feel like a slow turtle! Filtering has always been a slow process. Even though I know a ton of keyboard shortcuts for working with filters, it's still time consuming. Whether I'm working with a familiar data set, or opening up a new file for the first time, I always struggle with finding filtered columns. I would rather be a Filter Rabbit! Throughout my career I have developed a lot of add-ins that help make Excel faster and easier to work with. Everything from common tasks like copy & paste, finding worksheets, and creating pivot tables. Now I'm on a quest to make filtering faster! It shouldn't take us so much time to find columns and apply filters. This game of horizontal "ping-pong" scrolling gets boring pretty quick. Through this experience, I've found that searching for columns is the slowest part of filtering. Often times I use Excel's Find Menu (Ctrl+F) to search for a column header name and jump to it. But this only works if I'm familiar with the data set and column names. This also doesn't tell me which columns already have filters applied to them. There are a lot of processes I would like to automate with filters, but a tool that allowed us to search and find columns would save a TON of time. I want us to be able to quickly jump through the worksheet to find columns and apply filters like a super fast ninja. So I started developing an add-in that does just that.​.. The Filter Mate Add-in will save you tons of time when working with filtered ranges and tables in Excel. Filter Mate is a productivity app that you can add to Excel. The add-in makes it super fast to find filtered columns, or columns you want to filter. You can think of it as your sidekick that will help you navigate large sheets of data. ​Filtered Columns: Quickly view a list of columns that currently have a filter applied. Column Search: Find any column in the data range quickly with a Google-like search box. Filter Hop: Jump between filtered columns like a blazing fast rabbit with a click of a button. The goal of Filter Mate is to help save you time when working with Filters in Excel. This simple add-in has features that will save you lots of time. You can see the columns that have filters applied. Quickly jump to any column. Modify the filters with the built-in filter menus you are familiar with. Filter Mate has a Google-like search box that makes it fast and easy to find the column you are looking for. Simply type any part of the column name, and the Field List will be filtered down to display possible matches. You can then select a field and hit Enter to jump right to that column in the worksheet. This puts an end to horizontal "ping-pong" scrolling back and forth across the sheet. It's a simple feature that will save you a TON of time! Filter Hop is a very simple feature that allows you to jump between filtered columns with the click of a button. If your filtered range or table has more than one filter applied, then it can take time to scroll horizontally between the columns to view/modify the filter. Pressing the Filter Hop button will jump to and select the next filtered column in the range. You can continue to press the Filter Hop button to cycle through each filtered column. Filter Hop can also be pressed with a keyboard shortcut. Filter Hop completely eliminates the need for horizontal ping-pong scrolling to find filtered columns. It's a super fast way to navigate your data and work with the filter drop-down menus. How Do I Become a Filter Ninja? There are a ton of features for filters in Excel. The drop-down menus, windows, and commands have a lot of options that can feel overwhelming. So I have put together an online course that will help you master Excel filters. The course is called "Filters 101". In this course you will learn all the filtering and sorting techniques I have used in my career to help me prepare and analyze data. I cover an overview of how to work with filters and all the important features of the filter drop-down menus. Applying filters to multiple columns. Filtering different data types: text, numbers, dates, errors, etc. Tying out numbers to summary reports. Totaling columns with the SUBTOTAL function. Sorting & retaining sort order. Filters 101 is an online course. You can watch the videos anytime you want on any device, in the comfort of your own home or office. The course is broken up into short bite-sized videos that are each about 5 minutes in length. Each video is on a single topic, which makes it easy to follow along and practice. This also makes it easy to come back and find videos you want to re-watch. Filters 101 is a shorter course comprised of four training modules. Each module contains 5 to 8 short videos. There are over 30 videos included in the course. Click the boxes below to view a brief description of each module. In this first module I explain how the filters work in Excel. I share tips for turning filters on/off, adding new rows & columns of data, and working with Excel Tables. Data types include dates, numbers, and text. It is important to know how to work with these different data types in Excel, especially with filters. This module covers how to get the most out of the filter drop-down menus for each data type, including errors, blanks, colors, and more. Filters can really help us tie out numbers between our summary reports and source data. They can also help us prepare and cleanup data for pivot tables. This module covers a variety of different techniques I have used in my career to help with data analysis. Sorting is another important feature of the filter drop-down menus. In this module I cover how to sort multiple columns and how to retain the original sort order of a data set. ​I have designed this course using my simple step-by-step learning system. This makes it easy to learn the course material, practice what you have learned, and apply it to your work. You get lifetime access to the course. Go at your own pace and access the course anytime. Download the Excel files I use to follow along and practice what you learn. Each video lesson page has a comments section where you can ask questions about the topic. I designed this course using my simple step-by-step learning system that makes it easy! The companion Excel files are included so you can follow along and practice the techniques. There is a comments section on each video lesson page where you can ask questions about ​each topic. ​The Advanced Filter is a feature built into Excel that allows us to apply filters for advanced or complex scenarios. We can apply filters with both AND & OR Logic across multiple columns with this tool. ​Excel Tables are another awesome Excel tool that can save us a TON of time when working with data. So I have added a bonus video that includes over 25 of my favorite tips for working with Tables. This video is packed with tips and will help save you even more time when working with your data. ​Both of these bonuses are included for free when you purchase the Filters 101 Course Package. Learning these Filtering skills will help save you time and work more efficiently with the filters in Excel. This knowledge combined with help from the Filter Mate Add-in will really make you a filter superstar! “I love Filter Mate, it's brilliant. I've needed it for so long. Not only does it save me time but it also significantly reduces my stress levels when looking for a column ( 1 in 100+) an almost daily occurrence!" "This is really great tool. I have a ton of spreadsheets that I get from people that have columns that span the visible area that are pre-filtered. One thing I do is document what is filtered in case I need clear everything then reset the filter at later time. Its great that Filter Mate allows you to copy an individual filter to the clipboard." Hi friend! My name is Jon Acampora and I'm here to help you learn Excel, so you can save time with your everyday tasks and advance in your career. Filter Mate is an Excel Add-in that you will install in Excel. The Add-in file is basically an Excel file that is saved on your computer. Once you install the add-in, the XL Campus tab will appear in the Ribbon. The XL Campus tab contains the Filter Mate buttons that open the Filter Mate window and perform Filter Hop. You can use Filter Mate on any workbook you have open on your computer. The XL Campus tab and Filter Mate buttons will appear every time you open Excel. The add-in includes detailed installation instructions and videos to help you get started. Will Filter Mate Work for Me? 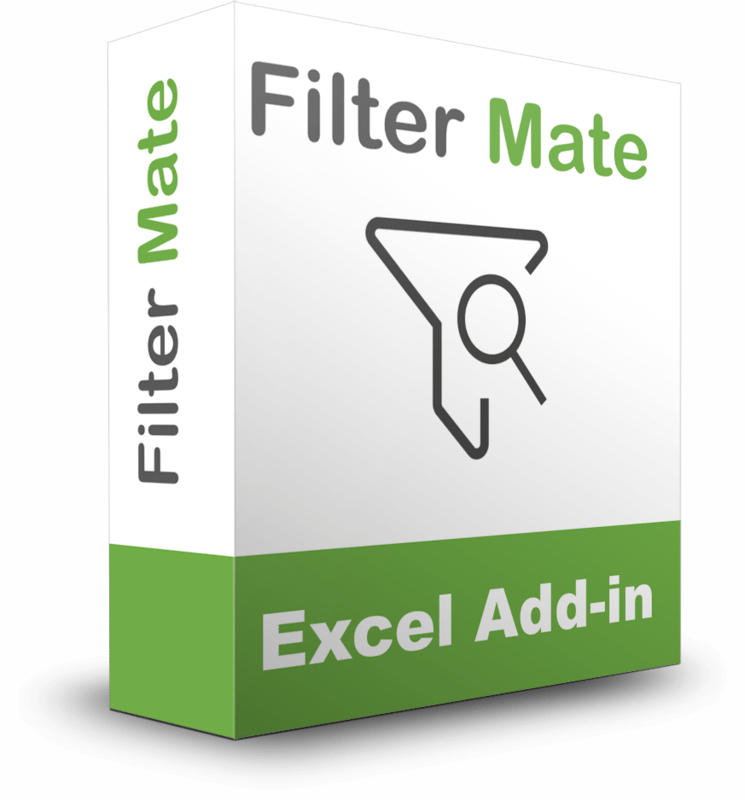 Filter Mate is compatible with all Windows desktop versions of Excel from 2007 to 2016 including Office 365. You do NOT need to install any software on your computer. You will save the add-in file to your hard drive and install the add-in within Excel. Filter Mate does NOT currently work with the Mac versions of Excel. Take Your Filtering Skills to the Next Level! The Filter Mate Add-in comes in two awesome packages to help save you time and learn how to get the most out Excel's filter features. Quickly Search & Navigate Columns. View a List of all Filtered Columns. Easily see the Filter Criteria for all Columns. Navigate to any Range or Table in the Workbook. Jump to each filtered column with Filter Hop. Learn how to use the Filters in Excel to prepare & analyze data faster. 4 Training Modules with over 30 short videos. Ask questions with comments on every lesson. The Filter Pro Package includes The Filter Mate Add-in and The Filters 101 Course. You get lifetime access to both products, including upgrades and enhancements. Right now I'm offering a limited time discount on this package for $57 (Reg Price $97, Save $40, 41%). This special deal won't last long, so join us and get this bundle package today. This package includes The Filter Mate Add-in only. You get lifetime access including upgrades and enhancements. Right now I'm offering a limited time discount on this package for $22 (Reg Price $27, Save $5, 19%). I will continue to add features and enhancements to Filter Mate in the future. Your purchase includes those free upgrades, and this is the only chance to get the add-in at this price. Filter Mate Saves Us Time, Tons of Time! All Excel Campus products are backed by my 30-day money back guarantee. If you are not completely satisfied for any reason, I will give you a full refund within 30 days of purchase. I know Filter Mate and the Filters 101 course will help save you a lot of time with you Excel tasks, and I want you to love these products. So give them a try for 30 days, risk free. Can I install Filter Mate on multiple computers? You can install Filter Mate on up to three computers that you own. You cannot share or distribute the files. How do I get Filter Mate once the purchase is made? You will get immediate access to the Excel Campus members site where you can download Filter Mate, and access the download any time. You will also be emailed a purchase receipt. Filter Mate has a lot of features, how do I learn them all? There is a dedicated help page for Filter Mate with videos and guides that will help you get the most out of the add-in. What version of Excel do I need for Filter Mate? Filter Mate is an Excel Add-in that works on all Windows versions of Excel from 2007 and beyond. This includes Excel 2007, 2010, 2013, 2016, and Office 365 (both 32-bit and 64-bit). Will Filter Mate be updated and will I receive these updates? Yes and yes! I have a lot of new features planned for Filter Mate and you will receive the updates for free with your purchase. I will also try to add features as you request them, and look forward to getting feedback from you. What if Filter Mate doesn't work for me? Filter Mate is guaranteed to work for you. If you are unsatisfied for any reason you can get a full refund within 30 days of purchase. Can my co-workers still use my files? Yes, absolutely! Filter Mate does not add any code or modify your files. It just automates tasks that you would normally do in Excel. ​You co-workers will not see the XL Campus tab or Filter Mate buttons unless they have purchased and installed Filter Mate on their computer. The course starts now and never ends! It is a completely self-paced online course. You decide when to start and finish. You can access the course from your work computer, home computer, tablet, and smart phone. You get lifetime access to the course. After enrolling an account to the Excel Campus members site will be created for you and you can access the course and all Excel Campus products anytime in the future. This depends on how much time you dedicate to the course. This is a shorter course that consists of 4 training modules and about 25 short videos. If you complete one module a week (about one hour), you can complete the course in 4 weeks or less. Yes! You will be able to download the files I use in the course. This makes it easy to follow along and practice. Can I download the video files? Yes, you can download the video files for offline viewing. This is great if you are watching them on the plane, train, or a place without internet access. Yes, you can watch the videos on just about any device with an internet connection. If you are unsatisfied with your purchase, contact me within 30 days of purchase to get a full refund. I want you to be fully satisfied and learn a lot! All major credit cards including Visa, MasterCard, and American Express are accepted. Can my employer pay for this purchase? Yes, you can use your company's credit card to pay for the course. A receipt will also be emailed to you that you can submit for reimbursement to your employer. Most companies are willing to invest in making their employees even more awesome! I am here to help you with any questions. You can contact me directly if you need any help with Filter Mate or The Filters 101 Course . You will also receive installation instructions and there is an online help page with videos that will explain all of the Filter Mate features in more detail. Filter Mate is very easy to use and it will work for you!